ATLANTIC CITY (October 23, 2018)–Welterweight contender Thomas “Cornflake” LaManna takes on former world title challenger Mike Arnaoutis for the New Jersey State Welterweight Title in the eight-round main event for will headline a full night of action on Friday night, November 16th at The Bourbon Room inside The Showboat Hotel in Atlantic City. The card is promoted by Rising Star Promotions. LaManna of Millville, New Jersey has a record of 26-2-1 with nine knockouts. The 26 year-old LaManna is a seven-year professional, who won his first 16 bouts. LaManna is currently riding a six-fight unbeaten streak. He has wins over Kendall Mena (20-3), and in his last bout he won an eight-round unanimous decision over Matthew Strode (25-6) on August 18th in Atlantic City. This will be LaManna’s 7th consecutive start in Atlantic City, and 20 bout overall on the boardwalk. Arnaoutis of Atlantic City, New Jersey via Athens, Greece has a record of 26-11-2 with 13 knockouts. Arnaoutis began his career in 2001 and was undefeated in his first 16 bouts, which included wins over Hector Saez (4-1), Former world title challenger Jesse Feliciano (12-2-2), Joaquin Gallardo (16-2-1), Roberto Santa Cruz (11-2), Jose Leo Moreno (12-0) & Marc Thompson (14-0). Arnaoutis fought to a disputed draw with future world champion Juan Urango. Arnaoutis challenged for the WBO Junior Welterweight title against Ricardo Torres on November 18, 2006. Aranoutis lost a split decision that many ringside observers thought Arnaoutis had pulled out the victory. Arnaoutis has picked up victories over Lanardo Tyner (19-0) & Nasser Athumani (20-5-2). In his bout, Arnaoutis lost to top prospect Jaron Ennis on June 1st in Atlantic City. In the eight-round co-feature, Chris Thomas will defend the New Jersey State Middleweight Title against Eddie Edmond. 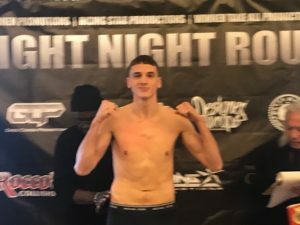 Thomas (10-0-1, 7 KOs) of Toms River, New Jersey won The New Jersey State Middleweight Title when scored a 3rd round stoppage over Darryl Bunting on June 1st. The 20 year Thomas is a two-year professional, and is coming off a 2nd round knockout over 147-fight veteran Roberto Valenzuela on July 28th in Hampton, New Hampshire. Edmond of Newark, New Jersey has a record of 4-5-2 with one knockout. The 32 year-old is a 10-year professional is looking to get back in the win column after losing to Isiah Seldon on May 27th, 2016 in Atlantic City. Also in an eight-round bout, Greg Jackson (8-7-1, 2 KOs) of Philadelphia takes on Juan Rodriguez Jr. (13-5, 3 KOs) of Union City, New Jersey in a welterweight rematch of a controversial bout that took place three years ago. In that bout, most people who saw that bout had Jackson ahead at the time of a melee that happened in the crowd, and the bout was halted as there was not any ambulance onsite due to it being used to transport injured fans. On November 16th, Jackson and Rodriguez will get it on again to settle the score. Miguel Cartagena (15-5-1, 6 KOs) of Philadelphia takes on an opponent to be named in a flyweight contest. John Bauza (11-0, 5 KOs) of North Bergen, New Jersey takes on an opponent to be named in a junior welterweight bout. Donald Smith (7-0, 4 KOs) of Philadelphia takes on Tyrone Luckey (9-9-3, 7 KOs) of Neptune, New Jersey in a featherweight contest. Yurik Mamedov (10-1, 3 KOs) of Brooklyn, NY takes on an opponent to be named in a welterweight bout. Omar Salem (5-0, 2 Kos) of Brooklyn, NY takes on Albert Delgado (0-5-3) of Roanoke, VA in a middleweight bout. Joel De La Paz (8-1, 4 KOs) of Atlantic City takes on an opponent to be named in a super middleweight fight. Ryan Wilczak (7-0, 3 KOs) of Scranton, PA will see action in a middleweight bout. Ry’Shine Collins (1-0, 1 KO) of Philadelphia will take on an opponent to be named in a bantamweight bout.